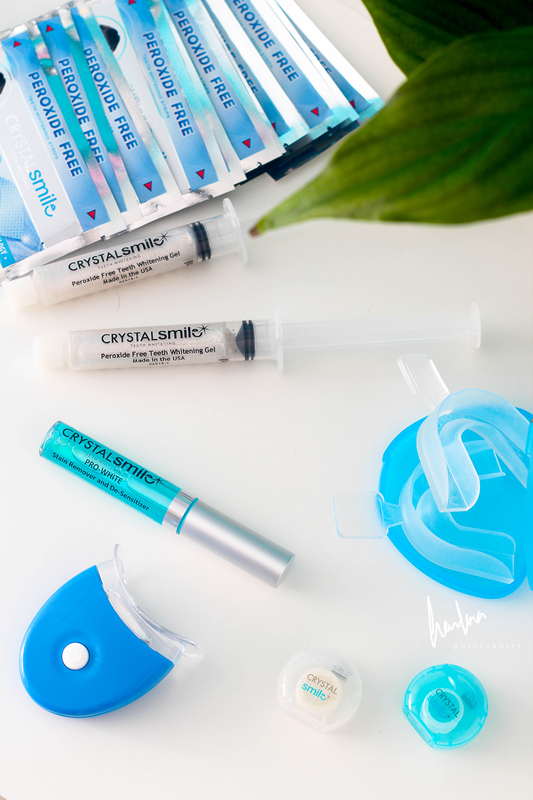 I've only used teeth whitening products, once before last year and I had good results so when I was approached by Crystal Smile I wanted to see if I'd have positive results. I was sent two different products to see which one I preferred which was nice of the company to let me choose an overall preference. First is the Crystal Smile Professional Teeth Whitening Deluxe Home Kit and also the 28 Crystal Smile Professional High Grade Teeth Whitening Strips (Peroxide Free). This is enough for 20 days of application, it's also suggested that you use it for consecutive days to get the desired level of whiteness. Then use every 3-4 weeks to keep on top of the whitening. My teeth aren't yellow yellow but they are stained and can always be in need of a little whiteness, who doesn't want pearly whites? Being that Crystal Smile is pretty affordable how did it hold up? I wasn't a fan of those thermoforming mouth trays, I find those come with most teeth whitening kits and I'm not much of a fan regardless of who the company is, I ended up using other trays I had that were moulded to my individual teeth. I would put the stain remover on my teeth beforehand, it also doubles as a desensitizer to help those who have sensitive teeth. Apply the whitening gel into the trays and place them onto my teeth - easy enough. You don't want to get the gel on your gums as it may give a reaction. Although I've never had this issue as I don't keep it on my gums to see if that'll occur. I put the LED light to rest on the trays and keep it on for 10 minutes and leave the trays in for another 40 minutes. Once finished I'll rinse my mouth out, the teeth look a little whiter, I've not experienced any blotches with the results but I noticed in the morning the teeth have reverted back to the prior colour. I feel as there's no peroxide it won't lighten the teeth to a huge degree on the first try but it does give it a lift. I can't say that you'll not experience damage to your teeth or gums because I haven't. Everyone has to use these products at their own discretion. Although the warning is Do NOT use if you suffer from gum disease, gum irritation, inflamed or irritated gums, bleeding gums, oral infection or tooth decay. Even though there's no peroxide and I had no visible side effects I couldn't bring myself to use it daily, I thought it was too much, maybe every other day is suitable. It's another addition to a routine but it could be something done before bed, I think this will be suitable for me before having to go to an engagement or something as it seems pretty temporary. I've not tried the strips just yet when & if I do, I will update.